[Updated] At approximately 10.00pm this evening [Dec 28] there was a shooting in Pembroke, and the police confirm that one person has been injured. Police can be seen in high numbers in the Bishop Spencer/Marsh Folly area. Further details are limited at this time, however we will update as able. Update 10.49pm: The police remain on scene with the road blocked off. We are expecting to receive a full police statement soon. 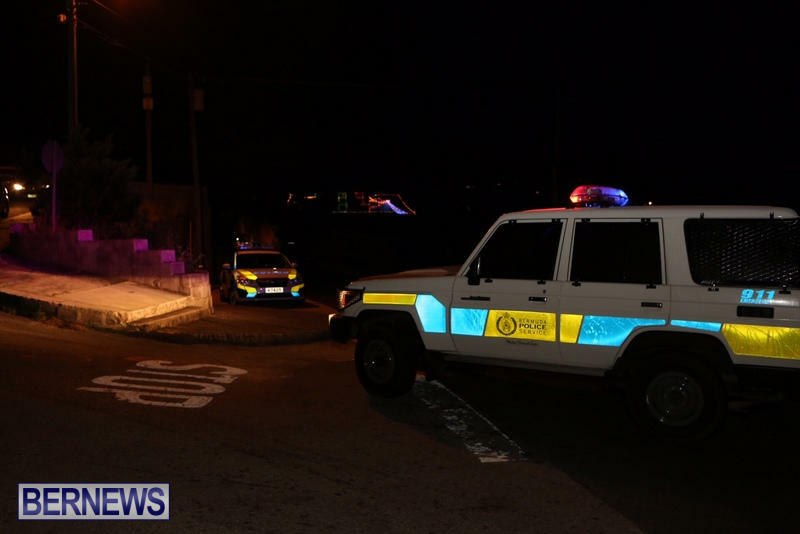 Update 11.19pm: Police confirm that they responded to “reports of several gunshots in the St Monica’s Road area” and a 34-year-old Pembroke man was injured, and said he is being treated for his injuries. 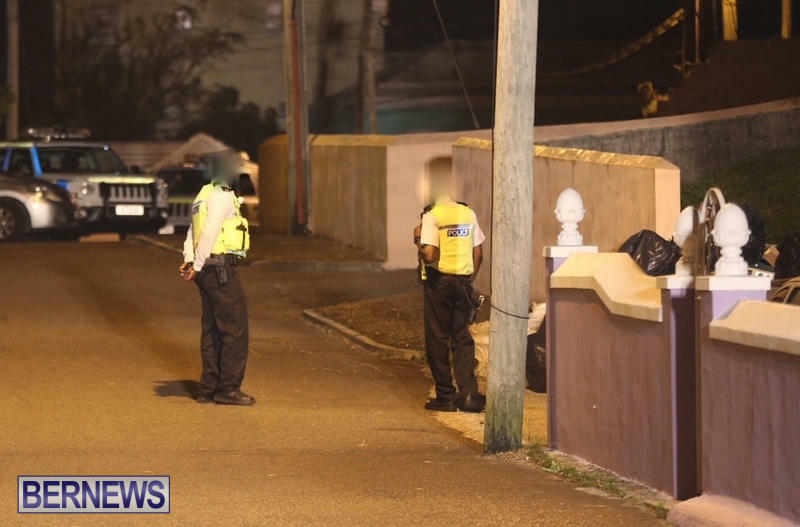 Update 12.39am, Dec 29: A police spokesperson said, “Around 10:05pm on Monday 28th December, Police responded to a report of several gunshots heard in the St Monica’s Road area. “Upon Police arrival it was ascertained that a 34 year-old Pembroke man had been shot. The man was conveyed to KEMH where he is being treated for his injuries. The extent of his injuries is not known at this time. Lord jesus what has my country come too…is this shooting nonsense gonna be of the norm for small Bermuda???? When are we ALL gonna come together and collectively take our country back??? unarmed citizens who are sheep do not fare well against armed criminals who are wolves. Criminals live in fear, you show them fear and you give them power. Stand up communities and march your local thugs to the police, before they rot all your communities children. Is that where the kids park is at the bottom of the street ? Several shootings, and an armed robbery over the festive period seems like a perfect time to be laying off police officers and attacking the pay and conditions of the officers that are left. Great job Dunkley and Jeff, I’m sure the officers will continue to put themselves in harms way knowing they are having to pay their own health insurance. Time to grow a set and tackle the bloated unionized govt workers and leave the people who protect us alone. While we are naturally disturbed about these types of crime, it should be understood that paying police officers large salaries etc. and increasing their numbers will not necessarily lead to a decrease in these activities. The question should be, are they being deployed efficiently and supervised properly? Did the police stop the shooting and armed robbery? No. Did the police stop the firearm from being smuggled into Bermuda? No. Did the police stop the knife from being used in a robbery? No. Did any officer put himself/herself in harms way during the shooting or robbery? No. Where were the police when the shooting & robbery took place? Not mentioned in the stories but they must have been somewhere. Solution. More pay, more police. Seriously Watcher? If someone picks up a gun and shoots at someone, some fool people blame everyone else, except for the shooter and his/her parents. All this went on while you were home counting sheep? Well to answer your questions in order, clearly they didn’t stop the shooting but could that maybe be that there are fewer and fewr officers on the street due to cut backs. No they didn’t stop the firearm being smuggled onto the island ports of entry are covered by customs and if you don’t understand that I wonder if there’s any point going on in this post, that being said that’s a customs office who are incapable of completing even basic files for court and the police service has to divert resources to do that for them. thankfully no officer had to put themselves in harms way this time but there are officers who have been shot at and firearms pointed at, the service has several officers on sick leave at present with significant injuries sustained when arresting people, so don’t be so glib about it. No one from the Police service has asked for more pay so i’m not sure what your point is there, they are simply asking for gov’t not to attack the pay and conditions they already have. What are you asking for the POLICE for? Just last week no one needed the Police. No one cared about the Police welfare. Maybe the Police are just doing what the public asked for and leaving them alone. Who will review the footage? Who will investigate the matter? When a suspect is identified who will put themselves in harms way to apprehend them? Hahahaha!……and Bermuda thinks they can function without Police. I suspect if the $$$$$ spent on the police budget were actually committed to actual police work, it might be better spent. How much of that budget is spent on guarding the Gov., The Premier, paying a massively top heavy admin group, and many other non Police type things..
And the government want to cut the police funding and officers pay. Wow. Their pay should be increased to think they stop people everyday who can be armed. Poor Monica’s Road. So many innocent lives have been taken, families torn and too many fatherless children. Why are you people putting the police on a pedestal for doing a job that they get paid for. Please long after the police appear on the scene, the gunman is long gone. What risk are they putting themselves in. Spare me. What they should be doing is solving the gun crimes! Now let’s all use the excuse that no one comes forward with evidence. Bore me less they don’t really care about the welfare of Bermuda or the occupants of the island! Do you know when the decline in Bermuda society began? When the violence began? That’s when people started to feel entitled. When they didn’t have to work hard to earn plenty. When they just gave to their kids without teaching them the value in earning it. That’s when the village ended and everyone focused on themselves. That’s why we weren’t resilient when things started to go bad. We didn’t react when it started happening. We didn’t react when it hit us in the face. A lot of people still aren’t reacting except by tantrumming because they can’t have what they want when they want it, which is now. How about we pick up the old values, shake the dust off them and start using them again. Work hard. Take pride in your work. Earn what you have. Ask for and accept help when you need it, knowing that when you’re on your feet you’re going to help someone else in the same way. When you see wrong speak up. When you know about a crime, or suspect a crime, tell the authorities. Know your neighbours, help your neighbours, listen to your neighbours. Spend time with your child. Listen to them. Teach them. Learn with them. And if someone tells you your child has done wrong, don’t immediately defend them. Take the information, sit the child down and talk to them about it. Then decide what sounds right. Because even with the best parenting, children can make bad choices. When things where great for who…. More Bermudians became unemployed during the big boom. The same boom the oba wants to take us back to. You’re a moron! Officers have been shot at, had firearms pointed at them and severely injured in the course of their duties. Spare me your glib dismissals if you think it’s so easy go put on a uniform and try it yourself like my family members do. As far as solving gun crimes they have an over 75% conviction rate that not good enough for you??? Like I said moron! A small Army of police and CCTV failed to stop the shooting. Makes perfect sense to hire more police, pay them more and install more cameras. I think the issue is bad allocation of officers and a select armed few will not solve the problem. Sadly shooting happen my question is what will happen if two shootings happen at the same time in different parts of the island. How will the police be able to handle that? Further police are always at risk especially the unarmed officers of intercepting or crossing paths with the shooters. What then? When did we as parents need to be in a panic and worried because our children are following the gombeys as a parent this is ridiculous. Come on Bermuda we are better than this. When parents started to complain about discipline in school, when movements were made to stop discipline in the very homes children live in, when having a baby daddy rather than a husband became popular…. Was in that general area a couple of weeks ago…. 6,7, 8, and 9 year old children out and about running the streets at 9 pm. Do parents have any idea where their children are??? Parents that bury their head in the sand and say…. Not my child!! spare the rod and spoil the child and this is the behavior you get, no structure, no discipline, this is the behavior you get! So why aren’t all children growing up to be criminals?????? Of course all children aren’t growing up to be criminals despite the odds thrown at them . But the fact is that the vast majority of people visibly out of control and also involved in criminal behavior DO have ‘something’ in common . But don’t take my word for it , demand to see ‘secret studies’ done within the prison services over the last 2 decades. And where is the voice of those ‘Preserve marriage’ people now ? Yes I Milk man ..See what happens when you dont want to pay the Babylon…I noticed more police vehicles than previous holidays parked up prospect and outide of Hamilton Police station. Babylon fed up with the govt!! Grow up child. “Milkman” “Babylon”. You have added up 1 + 1 and come up with minus reality. The police don’t do sh**mmm you people talking bout they don’t need to have budget cuts. When a the last tune the police done any real police work and PREVENTED a shooting. While Dunkley and the good Senator was having a after robbery photo shoot , someone was shooting bullets into people … But that’s not right , let’s look at the old newsreels to see what Ol’Dunk had to say about what HE would do about gun crime if elected . I bet he made promises that he damn sure couldn’t keep . Meanwhile the Baron says very boastily …. ‘If you see something , say something .’ Well here goes ; I see the Dunkley and Baron are way, way outta their league on this one , they haven’t a clue , and after three years they are no closer to understanding the problem then they were when they were canvassing for the paycheck they now receive to stop the shooting . Meanwhile the PLP/UPB said those same promises and what happened…….NOTHING! Both side are wrong, but welcome to politics. Come better than that Decaf! The Police are reactive not like they would have been able to do anything anyways, nice try! You think the PLP/UBP has a clue? Nope the UBP/BDA /OBA raised hell when the PLP suggested bringing in a SWAT team to crush the leading heads of the punk gun movement . Not to be deterred the PLP reached out to the UK and recruited the best they could find who had previous experience in dealing with gun crime . Please you people, logic has to prevail at some point…. cheesh…..do you really think police can stop crime…. the criminals would have to stop crime by not engaging in it. I dont care how many officers you hire… how many health insurance benefits you pay… violence and crime will ALWAYS exist…the criminals will just find alternative ways to do their mess… its as simple as that. I agree it starts from the home… however, when your children grow up and get around peers and start experiencing life as we know it, they tend to make their own decisions, some of your values stick with them others dont and they form their own. Some of these criminals come from good backgrounds, daddy there or not…. single parents dont have an excuse as to why their kids are they way they are if they are not law abiding citizens… many single parent kids are doing exceptionally well. At the end of the day, if you look in other jurisdictions where police officers (ALL OF THEM) carry loaded and live firearms on a daily basis and still crime exists there… they have all out shootouts and crime still exist there. It all boils down to the individuals CHOICES…. so stop blaming the police, the government, the parents, and whoever else you see fit…. its the individuals engaging in this behaviour… the POLICE cannot be everywhere.. dont care how many are on the force. POINT BLANK!!!! A father called 911 because his mentally ill college son was having a breakdown,fast forward in a few seconds of the arrival of the police his son and neighbor was shot dead. Who do you call in Bermuda, who do you ask for help, especially as a person of African descent. Is it safe in Bermuda to introduce our black children to the Justice system… Where they say once in, you never come out…. And when the shooting is done wherever shall the country go. A life revolving around crime and hate and despair shan’t be prosperous. No matter how bad someone may be let love succeed. There should be an amnesty in Bermuda to turn in all firearms by the 31st of March. Anyone caught with a firearm on their possession after that date should get a mandatory 10 year sentence even if not using that firearm. If caught using a firearm a mandatory life sentence!!! WE are the ones who can control our own society. WE are the ones who can take it back. WE are the ones who can implement punishment for not living the life our society expects! Firearms are ILLEGAL in this country and if we don’t announce an amnesty and TOUGH sentences, this S*&T will continue!!!!!!!!!!! These are terrorist attacks we do want to believe it but it is..How about if ewe had a major terrorist attack what will the government do then.They will bend over backwards to catch those offenders.